Securely sort, store and transport cash. Perfect for fundraisers, snack bars, garage sales, festivals, street fairs, petty cash, small businesses and more! Sorts and holds each denomination of bills in place. Spring-loaded, cantilevered dividers hold bills in their place even in a windy outdoor environment. No mixing of bills and coins! Coins store neatly by denomination in five upper tier trays. Stores checks and large denominations too! Storage space in rear of cash box allows checks and large bills to be stored safely and out of sight. Folding handle and compact size make it perfect for transportation and storage. Having a garage sale? Run a small business? Holding a fundraiser for your school, team or church? You can count on the Kolibri Locking Cash Box to keep your hard-earned money safe and organized. 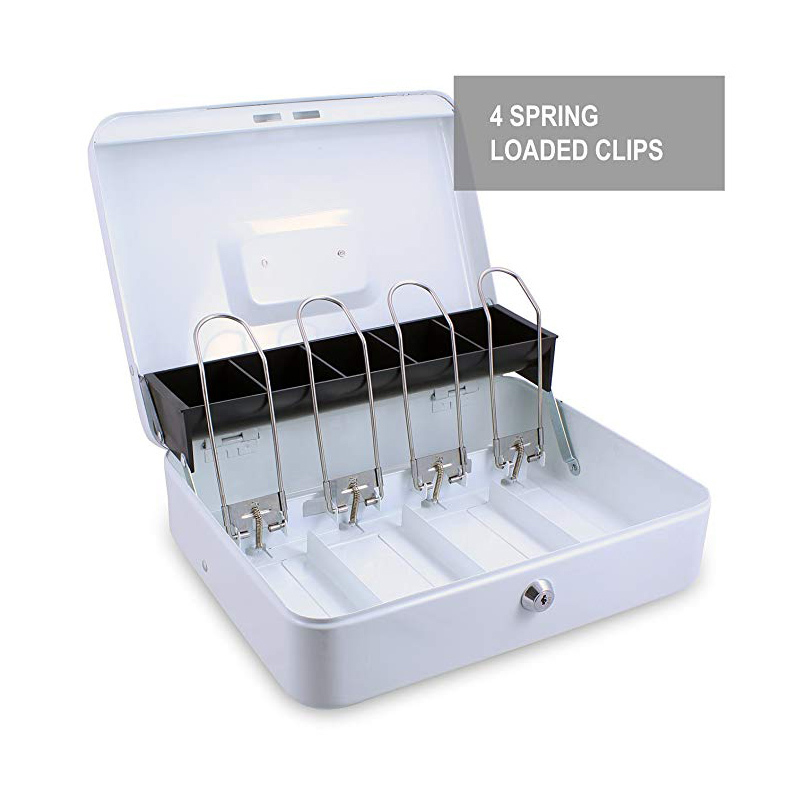 This durable steel cash box includes four spring-loaded, cantilevered dividers separate the 1s, 5s, 10s and 20s you collect while holding them snugly in place– even during windy outdoor sales! 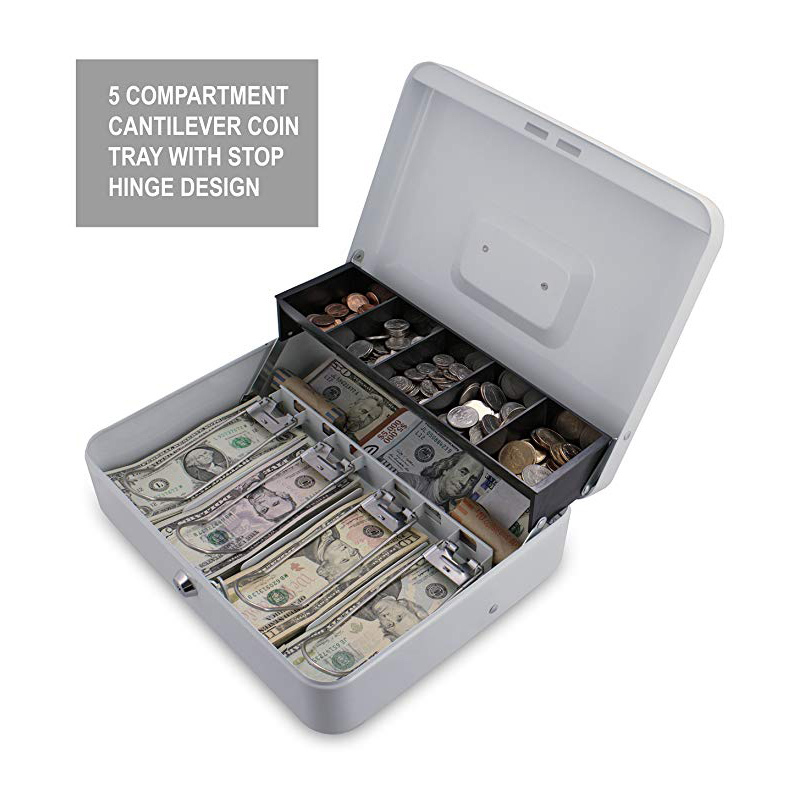 An upper tier of five coin trays also keeps pennies, nickels, dimes, quarters and dollar coins neatly in place so giving and collecting change is quick and easy. 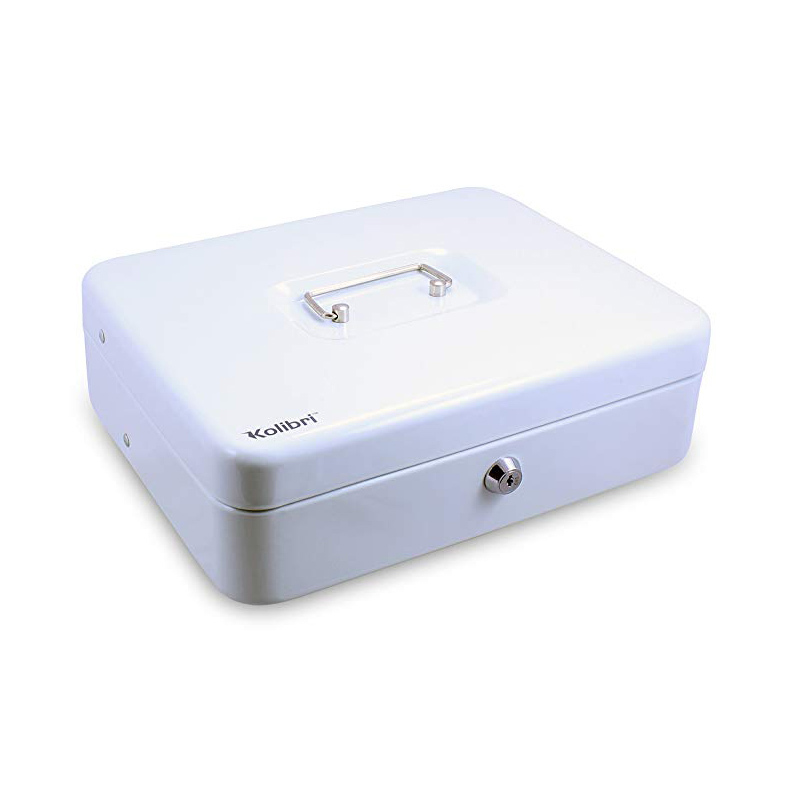 The Kolibri Locking Cash Box also includes discrete rear storage space for large bills and checks. To secure collected cash, simply turn one of the two included keys in the built-in security lock. 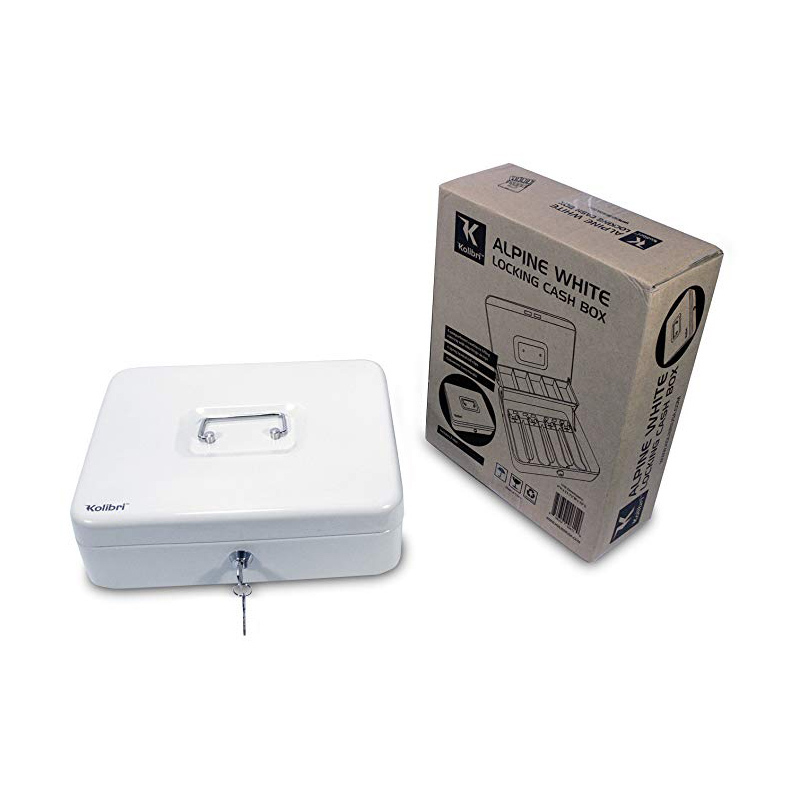 With a recessed, folding handle and compact size, the cash box allows for easy transport anywhere it’s needed and the eye-catching Alpine white color looks great in any selling environment. What are the benefits of having a cash box? 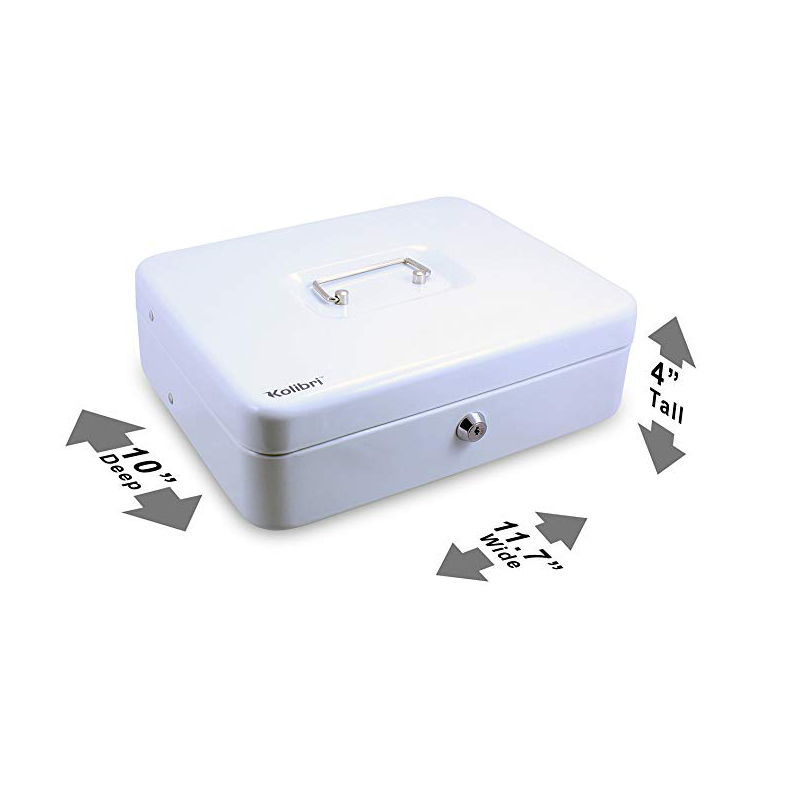 A cash box for large bills, checks, and coins is essentially a smaller, lighter safe or strongbox that you can store in a drawer, on a tabletop, or even carry in a bag without having to worry that your coins or banknotes will get mixed up or damaged. Quality cash boxes are made of strong materials such as steel, and equipped with locks that prevent unauthorized access. Cash boxes are the perfect money-storing solution for people who are conducting or working at rare or one-time events such as garage sales, fundraisers, snack bars, Christmas fairs, and festivals. A cash box in a store is also an ideal option for small businesses that mostly work with cash and can’t afford or do not need bulky, expensive cash registers. All you need is a Kolibri large cash box and one of our money counter and counterfeit note detector machines such as the Kolibri bill counter with counterfeit detection or the Ace money counter and counterfeit detector, and your store or one-time event will be fully equipped to safely conduct its business. 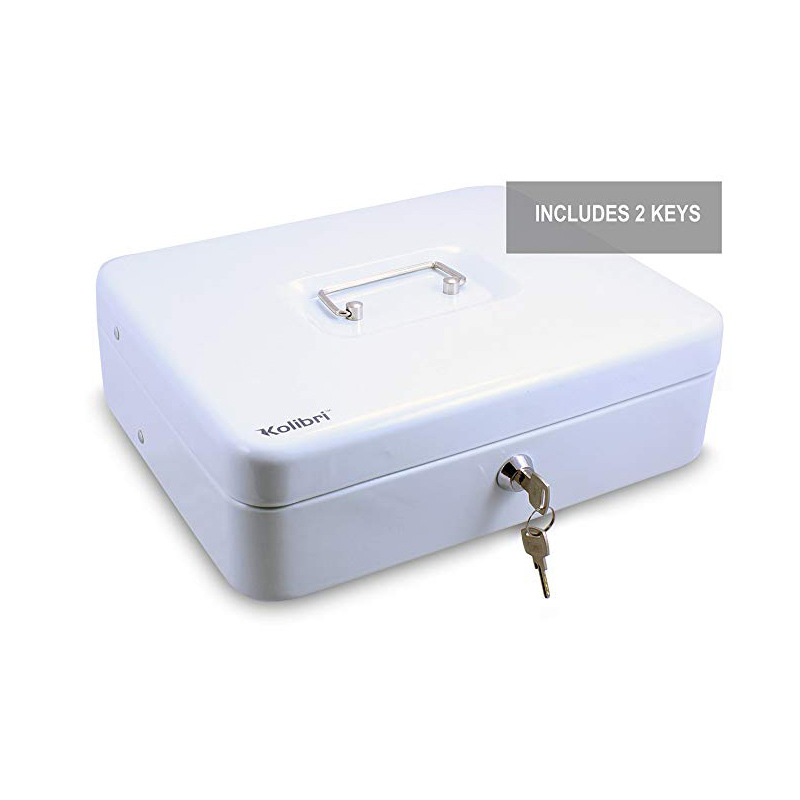 How to pick a very secure cash box? Kolibri’s dependable cash box for large bills, coins, and checks is made using high-grade components and durable materials that ensure safety and reliability. The lock uses hard to replicate key patterns and is designed to be resistant to physical damage. Its sturdy construction means that you can drop it on a hard surface such as stone or concrete and it won’t burst open. Where to buy a cash box? To keep your money and important documents organized, safe and protected, all you need to do is browse through cash boxes online, compare products to find the right solution, and then order your preferred cash box from a trusted supplier. 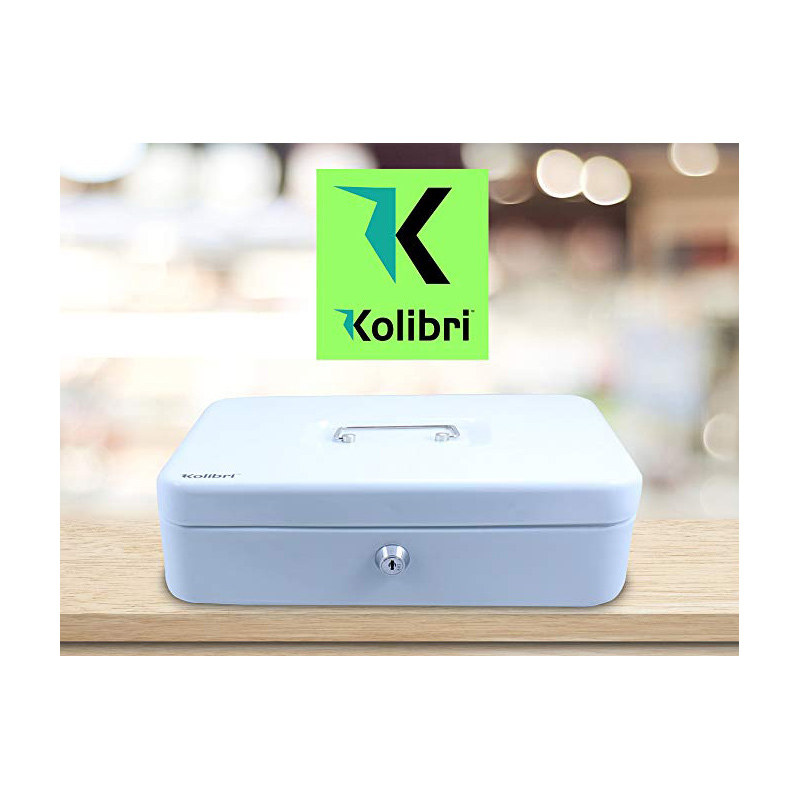 Whether you need a cash box for a small business or just to hold some petty cash, Kolibri offers the best cash box available today, and you can purchase it on Amazon.com. Our large cash box with a lock, tiered coin trays, and cantilevered cash trays is the perfect solution for storing cash. What’s more, its folding handle is expertly designed to enable easy transportation. Its white color makes it look professional and aesthetically pleasing to both yourself and your customers. Combined with our Rook money counter and counterfeit detector, or our Signature mixed denomination currency counter, it equips your small business or one-time fundraiser or garage sale with everything you need to ensure safety and convenience for your cash transactions. Having a straightforward system for treating cash sales goes a long way toward building familiarity and streamlining your payment process. Make a practice out of always taking the money from the customer, placing it in a visible spot, recording your transaction, filling out the receipt and giving it to the customer, and then putting away the cash in the large cash box. This way, you avoid unnecessary confusion and minimize potential errors. Always do cash reconciliation at the end of the day to ensure you’re not missing any cash, checks, or credit card receipts. Keep in mind that, a lot of the time, your reconciliation will be off by a few cents or even dollars. Don’t let this frustrate you. In small businesses and events like fundraisers, there’s a lot of “penny rounding” going on. For example, if a customer is supposed to get $3.90 in change, you will give them $4.00. Of course, it also goes the other way around, with customers opting to tip you by not taking small amounts of change, so this is nothing to worry about. Sales days can be hectic and draining. There’s a lot of stuff to keep track of, and quick little purchases such as buying lunch, a warm latte, or a small festival gift for a loved one, are easy to forget. And yet, such expenditures can cause you to come up $10 or $20 short during reconciliation. To prevent such frustration, plan ahead and have some petty cash in your wallet or pockets for such expenditures. If you have to take the money out of the cash box, make sure to write a note that a specific amount was taken for personal use.